He recognizes over 50 words/their meaning. As most Paps, he thinks he is in charge. He loves to play "keep away" with whatever he can find (of yours)-socks and tissues are his favorite, basically if it's on the floor or in his reach, he will "claim" it. Your job? Chase him until you get it. 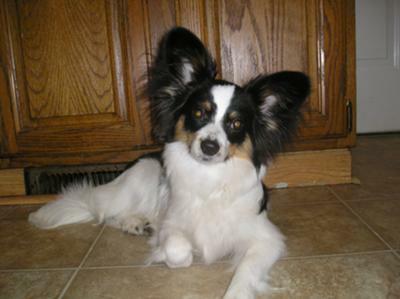 My Papillon is very sweet, and loves to give "kisses" but he is also sneaky. When caught "red handed" he will "pretend" he was actually playing with one of "his" toys. He is jaunty when he walks. Tail is always wagging. He tends to "pounce" upon prey (bugs, frogs etc) like a fox. He is also cat-like at times, with the way he flops around on his back while kicking a toy. I highly recommend this dog for an active family. I always see "delicate" when discussing this breed-it depends upon the size. My dog is 12 lbs and 11 inches tall. Trent is not "delicate" and loves to play "rough". Some Paps are 5 lbs and 8 inches high-they may be delicate. Trent is a very cute Pap. Sounds like you found a great family dog! Unless you ask the cat. His happy-go-lucky disposition is definitely characteristic of most Papillon temperaments. When I think of these cute little dogs, I also think about dog tricks. You didn't mention it, but I wonder if you have taught him any tricks. I went to the Pendleton Roundup last year (the 100th anniversary), and the rodeo clown had a Papillon that was an absolute riot. He did all sorts of jumping tricks, playing dead, falling when he was "shot," weaving in and out of the clown's legs as he walked, etc. One of the highlights of the rodeo (at least for me!). Funny thing about Trent's size. As a toy dog breed, most Papillons don't get larger than about 10 pounds, so yours is unusually large. Glad you found a winner!